Whoopi Goldberg is coming to the defense of one of the Trump's. 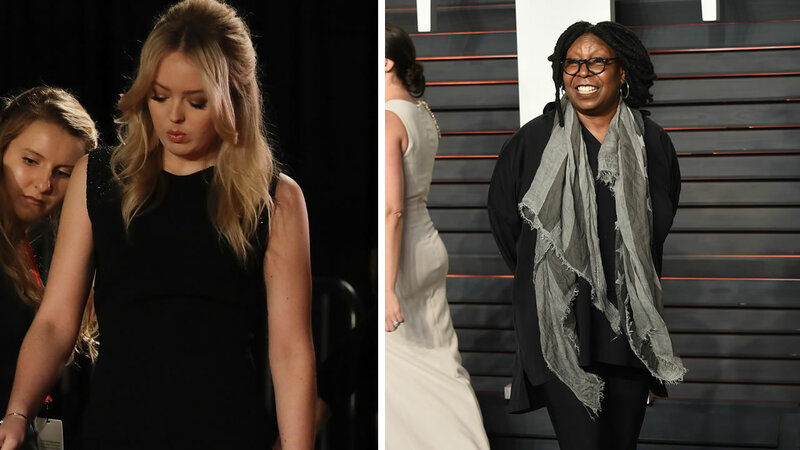 During Wednesday's episode of The View, Goldberg discussed reports that Tiffany Trump was snubbed during New York Fashion Week earlier this week. While sitting front row at the Philipp Plein show, fashion writers tweeted that no one wanted to sit with Trump. "You know what Tiffany? I'm supposed to go to a couple more shows. ... I'm coming to sit with you," Goldberg said Wednesday. "Because nobody is talking politics at the shows, you're looking at fashion! She doesn't want to talk about her dad. She's looking at the fashion!" Goldberg went on to say "Girl, I will sit next to you because I've been there where people say, 'Ooh, we're not going to sit next to you. I'll find your a-- and sit next to you." Trump, the only child from the president's six-year marriage to actress Marla Maples, responded to the comedian Wednesday night. She tweeted, "Thank you @WhoopiGoldberg I'd love to sit with you too!"